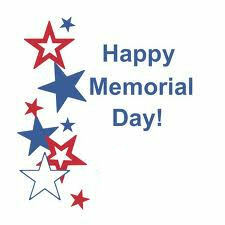 Hello everyone and Happy Memorial Day! I hope you've had a great weekend. I will keep it brief today since I hope most of you are enjoying your long weekend. I definitely wanted to take a moment to express my deepest gratitude to the men and women past, present and future who have dedicated their lives to protecting ours. Thank you so much and I pray for your safety and peace of mind. You are truly heroes! 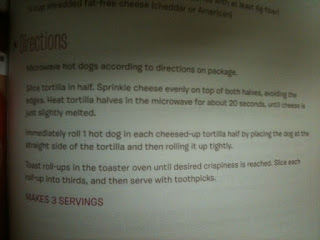 I did want to share a quick recipe for this week. This is a slimmed down version of a BLT. The recipe called for turkey bacon but I used Oscar Meyer's pre-cooked bacon that you just pop in the microwave. 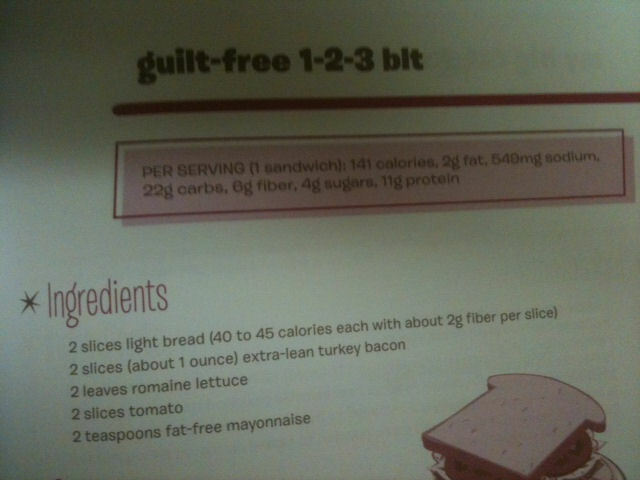 They are small slices of bacon and only cost you 70 calories for 3 pieces. Also, I don't like cold, uncooked red tomatoes on my sandwiches or salads. 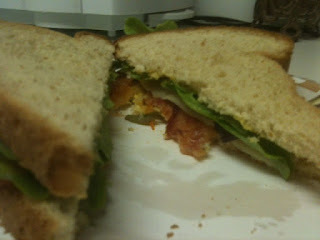 If I make a BLT, I like a green tomato that has been cooked or fried. This isn't the season for green tomatoes so I got a small vine tomato and sliced it thin and sauted it in a pan for a few minutes with salt and pepper before putting it on my sandwich. This, for me, is a perfect substitute for the real thing. Sure, mayo and lots of cheese and a fried green tomato would be better tasting but we all know where that leads us. This is my last week of "No-Weigh-May." I will hop on the scale again this weekend to see where I'm at. 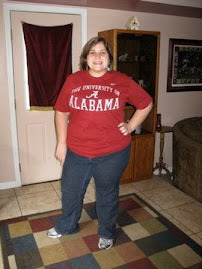 I'm hoping I am not too many pounds over my lowest weight. I wasn't perfect this weekend but I have been way worse. I just sort of spent the weekend craftily finding loopholes for the rules I set up myself. We will see. I will let you know how much work needs to be done to get the rest of birthday month weight off. I have been exercising like crazy as usual and I even mowed my parents lawn on Saturday because they are on vacation and I thought it would be a great workout (which was awful and I will never do it again). So, I am on track and will be for the next couple of weeks. I am going to Colorado on Father's Day weekend for work and I know my eating schedule will be off then so I'm going to try and keep it pretty strict until then. Be safe & have fun. Bye! Well, here we are again. It’s another manic Monday. As you may remember, it’s “No Weigh May,” so I haven’t stepped on a scale since April. Right now I’m still in recovery mode from my birthday and I already feel like I’m making progress. I don’t feel so swollen. 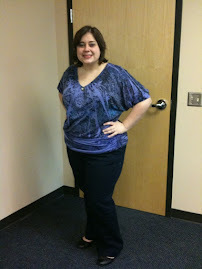 I’m certainly a little less frumpy than I was last week. Hopefully by the time I weigh in the first few days of June, I won’t have much more making up to do. I had a bit of oral surgery last week. I had some tissue removed and frankly, I’m not recovering as nicely as I would like. Anyway, I’ve eaten even more soup than usual which I didn’t think was a possibility but evidently it is. Because I eat soup out so much, I don’t usually eat it that much at home but since I’m drinking my food more than chewing it these days, I thought I’d give it a shot. I’m sorry that the pictures are a bit blurry. I was using my iPhone (which happens a lot so blurry pictures are frequent). 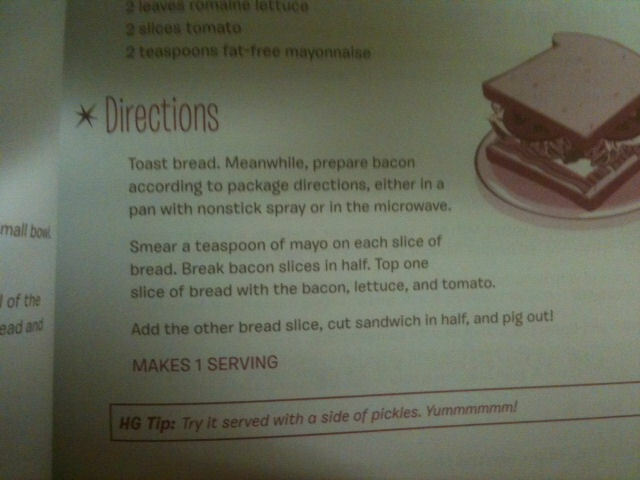 The recipe couldn’t be easier. 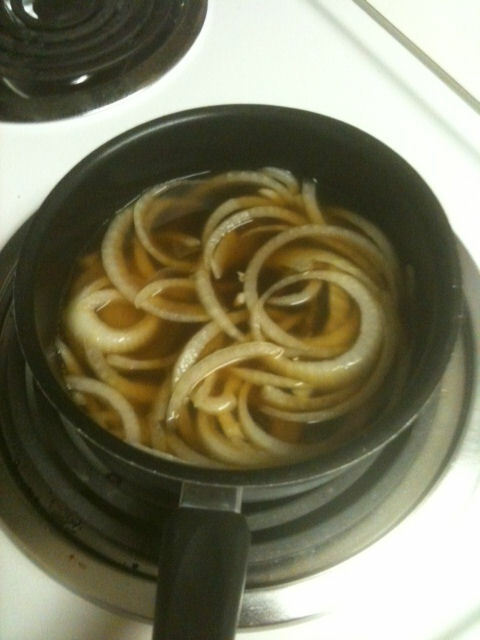 All you do is simmer the broth and the onions together for 10 minutes. Leaving them in 10 minutes leaves a bit of a crunch to the onions which I like but if you want yours completely done, you may want to leave them a little longer. 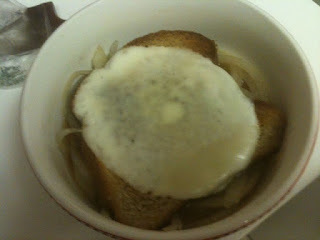 I added the bread and the cheese to the top and it was a warm, tasty treat. I have a random tip to share. This may seem obvious but I’ve learned this the hard way. Before you set out to make a recipe, make sure to not only look at the ingredients ahead of time but also the instructions. I have bought ingredients to make recipes before and then when I got home they required a food processor or an emulsifier (neither of which I have). If the recipe requires something funky or something you don’t own, it’s probably for a reason and recipe may not work without it so just make sure to pay heed to the direction. 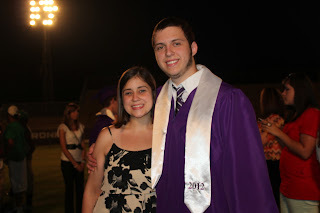 Well, my brother did it! He’s a high school graduate. We are all so proud of him! I am looking forward to what the future holds for him. Congrats again, David! Even though my birthday was last Sunday, I had a couple more pictures to share. 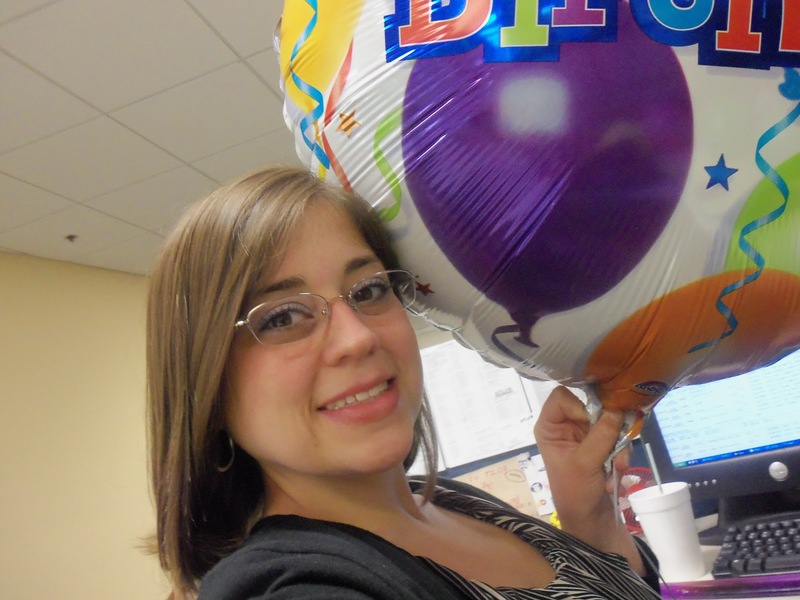 My office mates threw a birthday party for myself and another coworker and got me a balloon. They also had a nice setup of food so thanks to them. Also, my mom made me a red velvet cake last night and it was AMAZING. 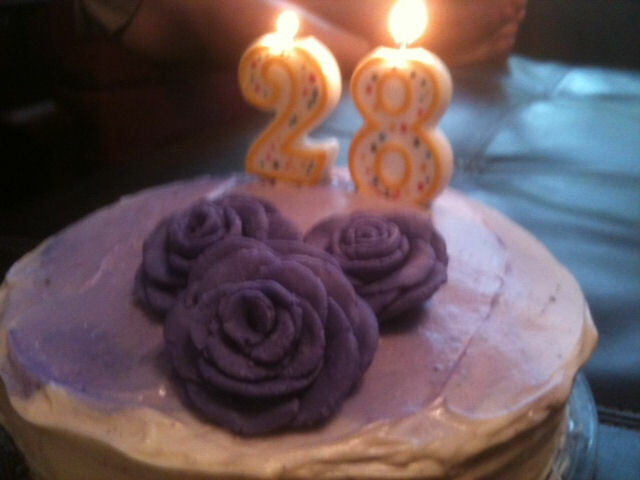 She used fondant to make purple flowers to put on top AND she made the inside purple too! I loved it! It has been a wonderful birthday season, I must admit. That’s all I had! Have a fantastic week and a great memorial day weekend! Please be thinking about my parents. They are leaving for a vacation this weekend to Denver. 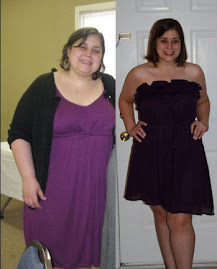 No, it's not Monday and no, this post isn't about food or weight loss. I've been a total disaster thinking about my brother and how grown up he is. Instead of sobbing all day, I wrote him a little letter and I thought I'd post it here. He doesn't read my blog often so he may never see it, and that's fine with me. 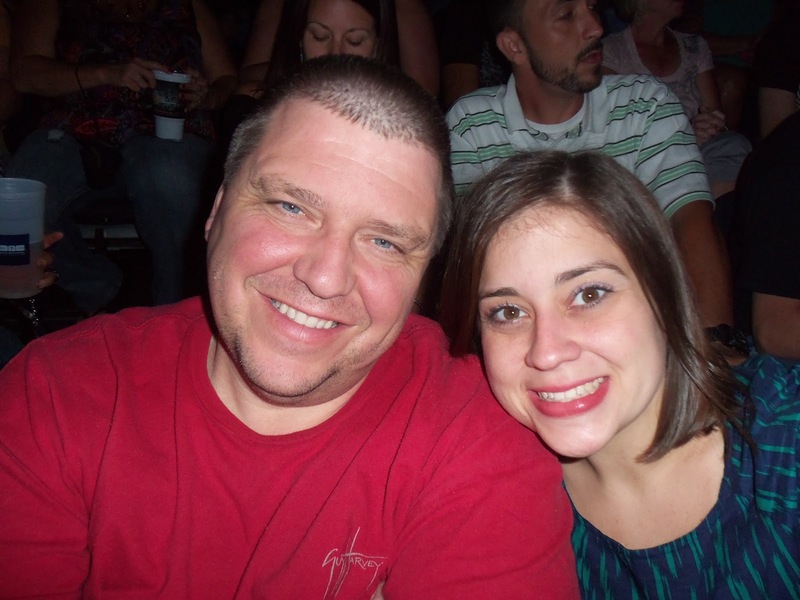 He knows how much I love him but I wrote it down and thought I'd share. I’m sorry I complained when you sprayed copious amounts of projectile vomit into my mouth when you were a baby. Thanks for always falling asleep on my chest better than anyone else’s. For all the times you came around with a notepad in your toy gun holster, asking me what I wanted to eat, I would love to go back and list things to you and your sweet face and cowlicked hair for forever. I apologize for paying you in pennies to run to the fridge for Dr. Pepper and punishing you with C-SPAN when you got on my nerves. I sincerely ask for forgiveness when the following things happened on my watch: you broke your arm, you ate dog food, I shoved you out of my room during slumber parties, you had your toe nails painted, you climbed the TV and it fell on you and you had to witness me massacre a roach with a shovel. Thanks for always saying I was a better blue’s clues maker than Steve. 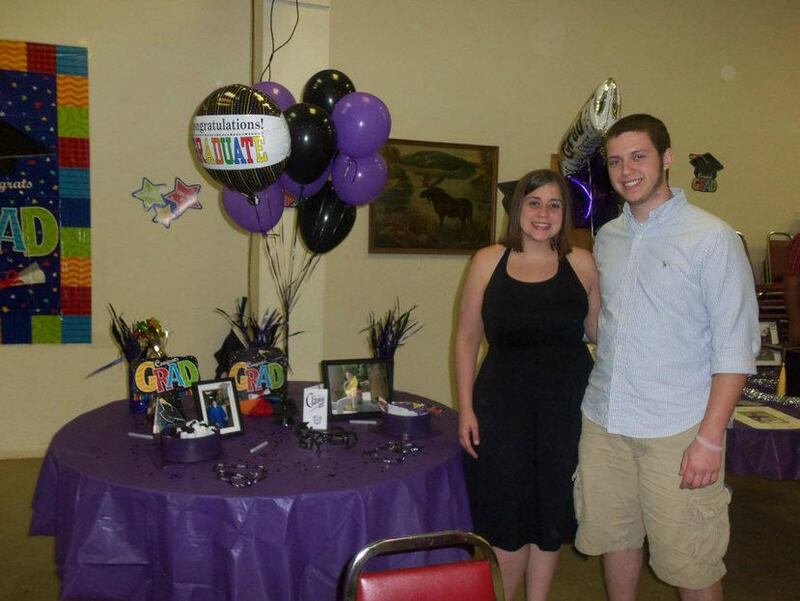 Also, thank you for caring enough about me to cry when you found cigarettes in my purse and then threw them away. You taught me how to love someone with my whole person. You taught me what it would look like when someone said, “he gets that from me.” You’re funny, caring, smart and the single most important person in my life. I hope I have taught you something. Come to think of it, I should have taught you the word copious because I feel you may not know that one right off. Part of me hopes you never read this because I don’t want to embarrass you and plus, I think my tears over the past few months in preparation for your high school graduation let you know that I feel like you are my child and I helped raise you. You’re my child, my brother and my best friend. If it is true and I did help raise you, you are welcome…because I did a good job. Hello All! Today has been the day of detox. I am too embarrassed to tell you everything that I ate last week so I will spare you all of the details but I have paid for it physically and mentally. I feel like I will be paying for it for awhile. All in all though, I think the birthday binge week works. I wouldn’t recommend it for everyone, especially if you are new to the game or a bit weak because you wouldn’t want anything to throw you off the wagon completely. I have done this several times and I’m sort of a pro at “going back” now so I think I’ll be fine. I won’t be blemish free this week but I will be mostly good and starting next week, I’ve got to go back to flawless so when I weigh in June I don’t pass out/cry/burn my scale. This week, I wanted to share a couple ways to jazz up a potato. Potatoes are pretty much the perfect food. Sure, when they’re fried, they aren’t good for you but when you have them baked, they are filling and full of fiber. 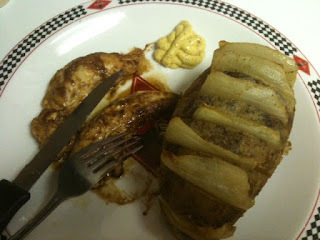 However, the potato by itself doesn’t have much flavor so I find myself looking for ways to make them more interesting. I’ve chopped them, sliced them, baked them and everything else and I wanted to give you a couple of ways to make your potato more interesting. 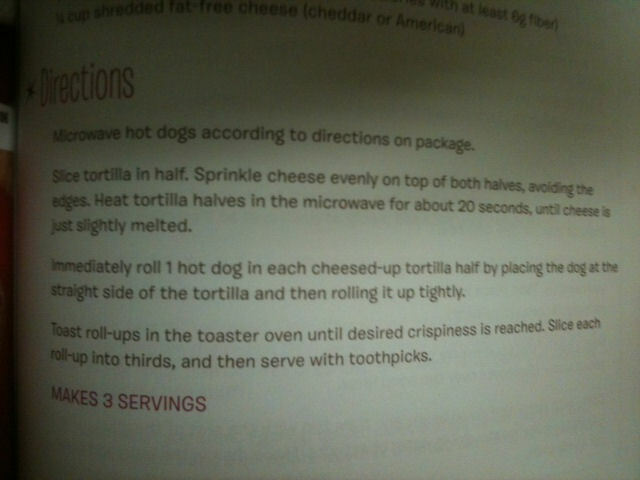 The first picture comes from a Pinterest recipe. I am impatient so I didn’t bake this quite long enough. I didn’t believe the time that I was given. All you do is take a potato, cut it into 1/4 to 1/2 inch slices without going all the way to the bottom. In between the slices, include onion, garlic, salt and pepper. The recipe called for butter but instead I took spray butter and olive oil spray and sprayed it in between the slices and all over the potato. Wrap it in foil and bake it at 350 for 90 minutes. Yes, an hour and a half. That’s a long time but it had a lot of flavor. The other potato pic is of a baked potato that I fake baked in the microwave and it’s topped with reduced fat French Onion Dip. Sometimes, plain reduced fat sour cream doesn’t really do the trick. If you can find it (and it’s hard to find) you get two tablespoons for 40 calories or so. It made the potato quite tasty. 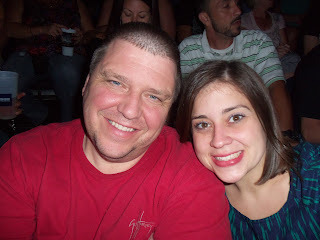 My Dad, brother, his girlfriend and I trucked up to Nashville on Friday night to see a rock concert. We had fun. 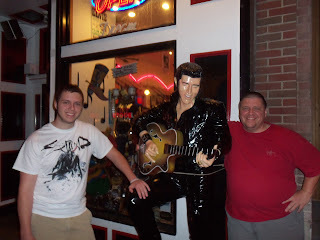 The music was a little much for me at times but I know my Dad had a blast so I’m glad we went. Since yesterday was both Mother’s Day and my birthday, my Dad did the cooking and he made an amazing meal! I ate way too much. He worked hard. 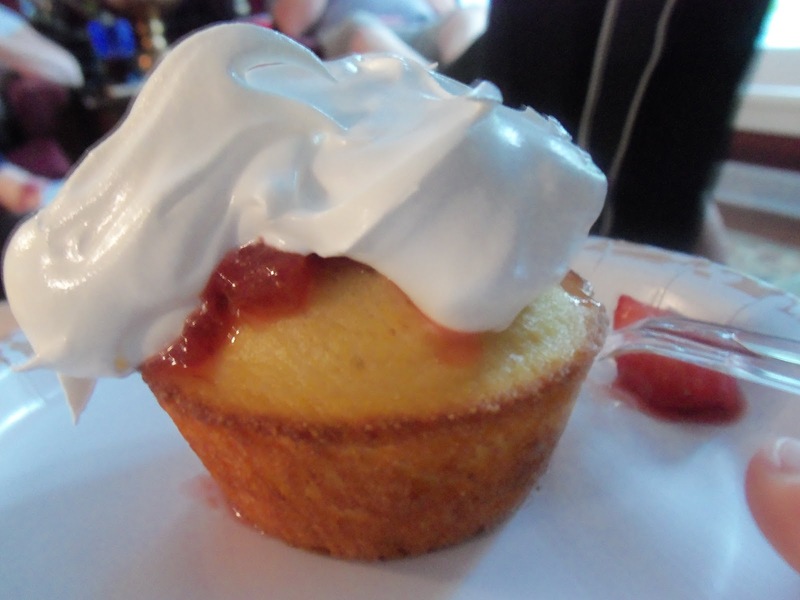 The second picture is the dessert that he made with strawberries to top the whole thing off. 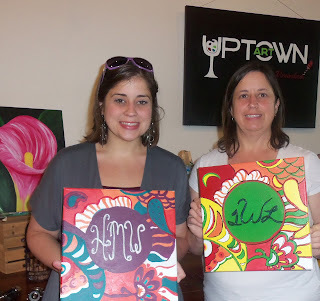 Mom and I also went to a Mother’s Day painting session at a place downtown. I am not an artist but I enjoy going with my mom and it’s nice to take home something that you made. It was a good day. 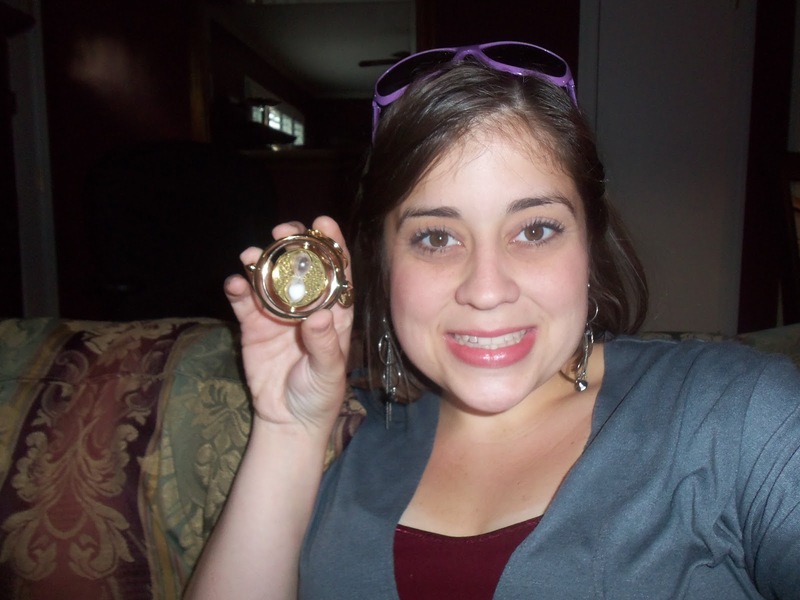 I also included a picture of me and my Time Turner (something from Harry Potter) that I got for my birthday (along with other, slightly less nerdy but no less awesome gifts). 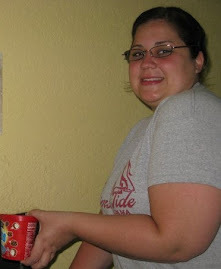 I want to give a birthday shout out to my friend Nichole! Her birthday is Sunday! Since May is a popular birthday month, I’d also like to give birthday shout outs to my friend Amanda whose birthday is today, my grandpa, whose birthday is Thursday and Kaitlin (Jordan’s sister) who is having a birthday Saturday. Best Wishes y’all. Not only is my Grandpa having a birthday and David graduating from high school on Thursday but my cousins are also expecting their second baby on Thursday. Busy week! 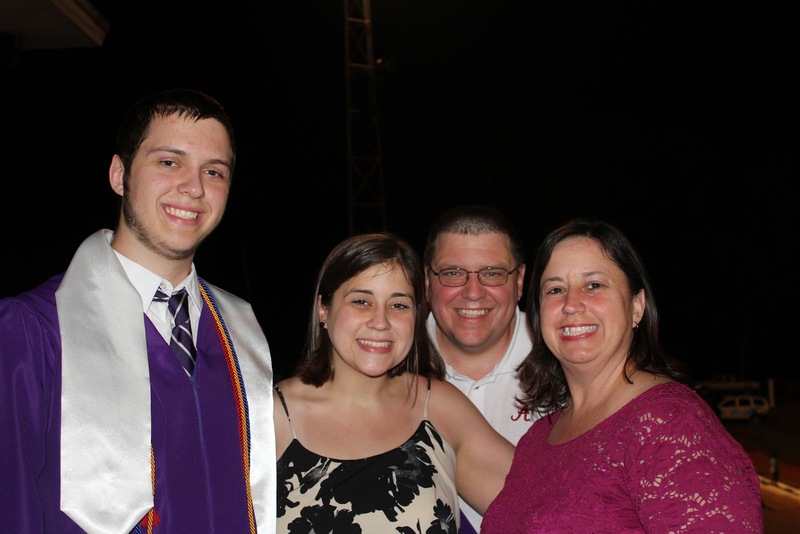 As I’ve mentioned 100 times, David is graduating from Holt High School this week and I couldn’t be more emotionally out of control. 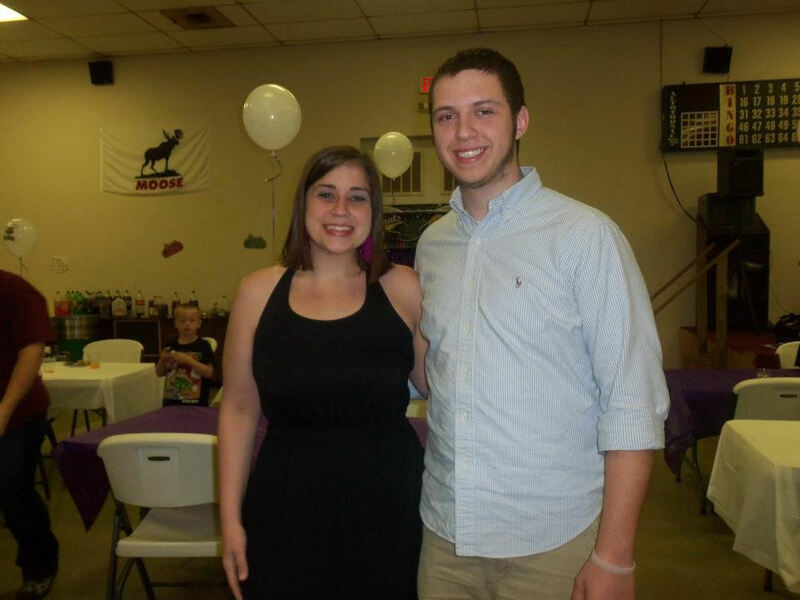 I also couldn’t be more proud of the person that he is. I’m so excited to see what the future holds for him! I know I will have a lot of pictures for the event. I hope y’all have a fantastic week! Don't knock 'em til you try 'em! Happy Monday Afternoon! I hope you had a nice weekend. I had a lot of fun over the last few days but I didn’t do much resting so it’s been a long day. In case you don’t remember, we are in the middle of no weigh May. It’s a good thing too because I ate entirely too much food this weekend. Also, this is my birthday week and ever since I’ve been on Weight Watchers, I try and catch up on the food I don’t normally eat because I’m dieting and chow down during the week of my birthday. I’m already feeling the effects because I’m bloated and my stomach is all puffy. I will have a fair amount of work to do to lose the weight from my birthday binge but to me it’s worth it. I make myself all sick on my favorite foods and then I am good for another year. 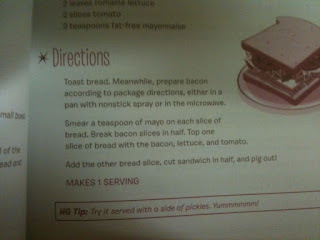 The recipe this week would be great for a party. It’s another one from the Hungry Girl. I know that when you hear the phrase “98% Fat Free” associated with a hot dog, it’s not necessarily an appetizing thought. I love hot dogs though so I eat the Hebrew National brand from time to time. There is no comparison between the Hebrew National 98% Fat Free hot dogs and a meaty one you can get on game day but it is satisfying enough...even with the odd after taste. It’s especially satisfying with paired with chili, or mustard and ketchup or cheese, or made into pigs in a blanket…or in this recipe. 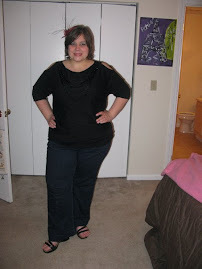 This is super easy to make and would be great for a cocktail party where people are conscious about their weight. 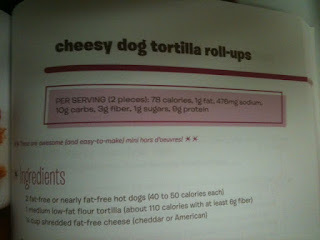 All you do is wrap them up in a low fat tortilla, add fat free cheese, heat them up in the oven and cut them into bite size pieces. 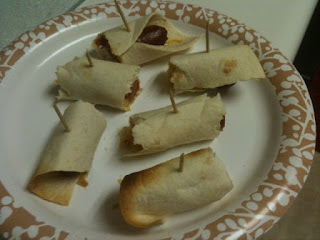 I put toothpicks in them even though I totally ate them all. Party for one, I guess. I think I’ve mentioned before that you should always watch serving sizes at restaurants because the portions are generally far too big. Make sure that you also pay attention to serving sizes at the grocery store too. 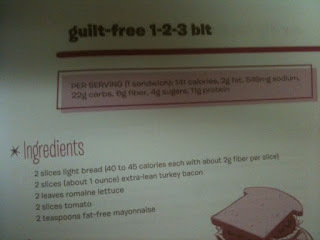 Sometimes, even food that comes in packaging that looks like it’s single serve has two servings in it. This happens a lot with smaller bags of chips and candy. 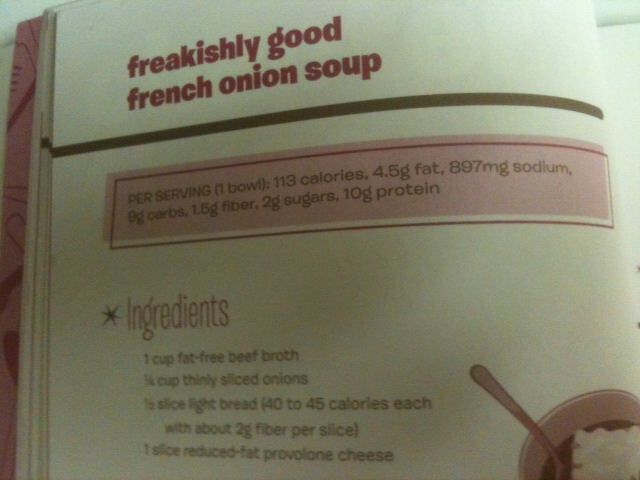 I find it to be the worst in soups. 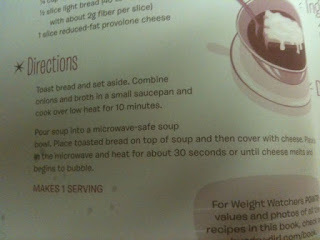 I picked up the soup that can be heated in the microwave directly in the container…it definitely looks like it’s made for one but it has two servings so just be careful because you may have to double the nutrition facts to be completely accurate. 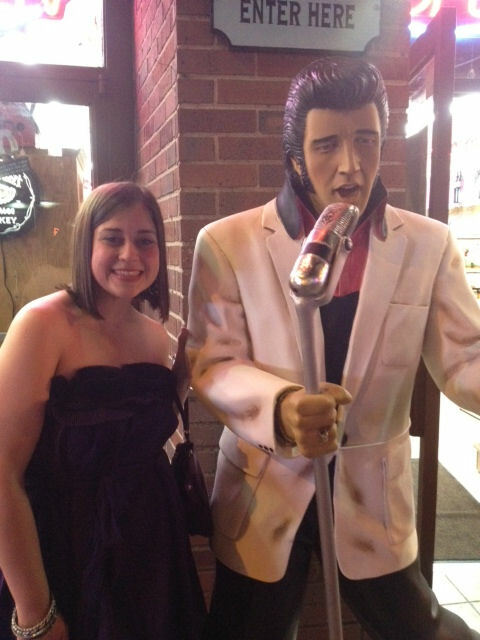 I started off my weekend heading to Nashville for a ladies night with my roommate and some other girls. We had a great time just hanging out in downtown Nashville. I woke up the next morning and headed to Birmingham to spend the day with Jordan. We ate good food, went and saw a movie and then played Monopoly. It was good to spend time with him. Sunday, I got burnt to a crisp going for a walk outside (put sunscreen on people…even if you are just going for a walk). I don’t know when I went from a kid that could turn into a tan little gingerbread in the summer to a lily white girl with the skin of an infant but I am I will be smarter next time and make sure to lather up. After that, I made dinner for my parents. It was their anniversary meal. I had help from my brother and his girlfriend which is always nice. I made a stupid error when it came to amount of sauce in relation to the amount of pasta so it was not as saucy as I would’ve liked but it was still OK. Plus we had bread with garlic butter all over it. YUM! It was a great weekend and the upcoming one will be awesome too. 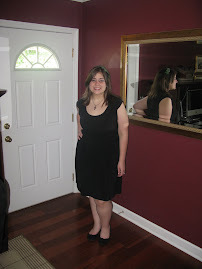 My Dad, brother, his girlfriend and I are headed to Nashville (I am going to own that place soon) to see a concert on Friday and then Saturday, I am going to a graduation party for my brother and some of his friends and then out for my birthday. Mom and I are splitting the festivities on Sunday because it’s my birthday AND Mother’s Day. So, it’s another exciting weekend! 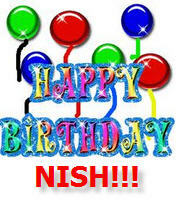 I want to give a birthday shout out to my friend Nish! Happy birthday, friend! I hope it’s a great one!!! (It’s actually on Friday) May is full of birthdays! 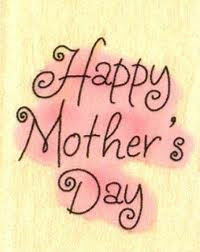 I also want to tell my mom Happy Mother’s Day. Even though I pretend that my mom is trying to steal my thunder because Mother’s day fell on the same day as my birthday, I really think it’s cool. My Dad is making dinner so neither of us have to do anything on Sunday. My mom deserves a day off! Happy Mother’s Day, Mom! Love you! That’s all I’ve got for now. I’m sure I’ll have pictures for you next Monday! Have a great week!